Working from home. Part time work. Flexible working hours. For many people, specifically parents, it’s the absolute dream. Whether you’re about to have a baby, or you’re a parent who wants to earn an income while staying home. Maybe your kids are at school, and you want to work, but you also want to be available for school drop-off, pick-up, sick-days and school holidays. You don’t need to be dependent on finding an employer to hire you with fully flexible working conditions. Let’s face it, there’s almost as much chance of finding a job like that as there is of finding a unicorn! You can create your own job or income opportunity that meets all your needs as a parent. 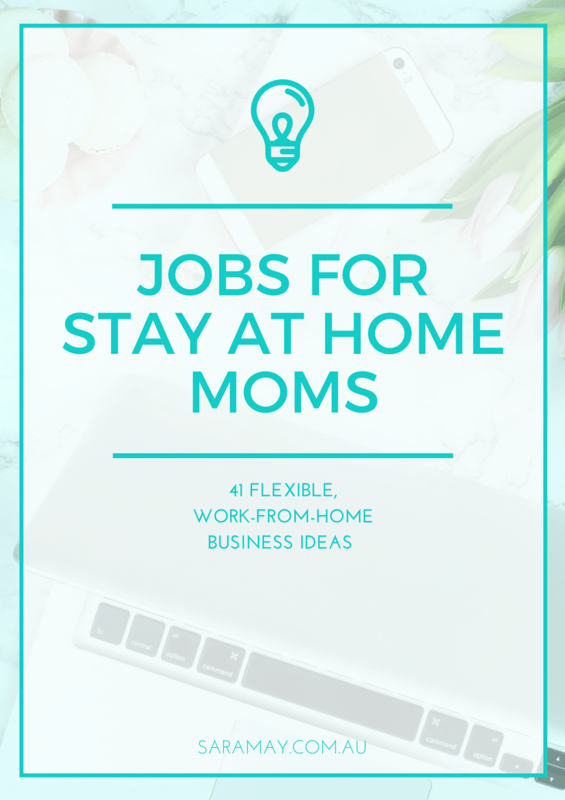 In this post you’ll find 41 perfect jobs for stay at home moms, that you can create for yourself. If you have administration experience, particularly as an EA or a PA, you could transfer those skills into a VA (Virtual Assistant) role. VA’s can offer a variety of services. Some specialise in traditional EA/PA responsibilities like email management, travel arrangements, transcriptions and minute taking. Others focus on more specialised skills like Social Media and Website management, basic graphic design work and video editing. You can get started by listing your services on freelance job boards like Upwork and Freelancer. This will likely mean you cannot charge premium rates, in order to remain competitve. If you really want to attract premium customers who pay you what you are worth, I recommend branding yourself and having your own dedicated website. Network with your past employers to obtain testimonials, and with business contacts to pick up your first clients. If you are bilingual or multilingual, you could offer your services as a translator. You can list your services on freelance job boards like Upwork and Freelancer. You can also incorporate translation into the services that you offer as a Virtual Assistant. Most transcription jobs are medical or legal, and require specific qualifications and knowledge base. If you do not have this specific experience, all is not lost. There is also room for fast, accurate typists to work doing general transcription. You can list your services on freelance job boards like Upwork and Freelancer. You can also incorporate translation into the services that you offer as a Virtual Assistant. If you have superb language skills, copy-editing is an area you could specialise in. You can list your services on freelance job boards like Upwork and Freelancer. You can also incorporate translation into the services that you offer as a Virtual Assistant. If you’re a bookkeeper or an accountant, you could offer online services. You can begin by listing your services on freelance job boards like Upwork and Freelancer. Bookkeeping is also a service you can offer as a Virtual Assistant. If you really want to be able to charge a premium rate, I recommend branding yourself and having your own dedicated website. With a background in marketing or communications, and a solid understanding of inbound marketing best practice, you could be a social media manager. Everyone knows that Social Media is VITAL in modern marketing. Many companies lack the resources or know-how to run effective social media campaigns. If this is something you have experience in, consider offering Social Media services on a freelance basis. It is also a service you could offer as a Virtual Assistant. If you’re a graphic designer, or you have graphic design skills, there’s plenty of freelance opportunities available. You can pick up 1-on-1 clients, as a traditional freelancer does. There’s also the option of creating editable templates for businesses on a budget. You can sell these on your own website, like Pink Hexagon does, or on graphic design marketplaces like Creative Market. If you have a professional qualification, you can leverage your knowledge into an online consulting business. You can list your services on freelance job boards like Upwork and Freelancer, and even Fiverr. Or you can create your own website and leverage your existing relationships to pick up your first clients. Blogging in and of itself is not something I would recommend starting as a money-spinner. While there ARE blogs that are profitable, they are few and far between. If, however, you have a background in journalism or communications, if you’re prepared to network hard to earn advertisers, and you have a specific passion or area of expertise that you want to write about, you could create a profitable online magazine. If you want to start an online magazine, you MUST invest in a professional website that will grow as your business grows. Check out my WordPress Quick Guide. It’s a FREE step by step guide to build your own website for under $100. Online education has been a growing trend for a few years now. It doesn’t look like it’s going away anytime soon. Think about your skills and knowledge – what can you teach other people? What are you REALLY good at? Depending on the topic, you won’t need a great deal of equipment to set up an eCourse. A computer, an internet connection and a camera that can record video (even your phone!) are enough for most eCourses. While you can host an eCourse on your own website, you don’t need to. There are a number of platforms available that can host your course and handle payments. In some cases they even market your course for you. Have a look at Skillshare or Teachable as eCourse hosting platforms. If you’re a travel agent with a passion for a certain part of the world, you could try your hand as a niche travel agent. The majority of people now book their holidays online. If you specialise in a specific area, have the contacts and know how to plan the perfect trip, an online travel agency could be a lucrative business. If you’re passionate about health and fitness, or you’re already a personal trainer, you could start an online personal training business. I found THIS blog post that outlines how to get started as an online personal trainer. If you’re a beauty therapist, a hairdresser or a makeup artist with a spare room, you can offer your services from home. A basic setup shouldn’t be too expensive, and should be enough to get you started. Make sure you do your research and check insurance requirements and licensing regulations in your area. A webshop is a fairly cost efficient way to start a retail business. While you have the cost of inventory, you do not have the cost of renting a physical location, and you may not need to pay for insurance. It’s possible to set up a basic, fully functional webshop in less than a day, for under $100. If you are a photographer who is looking to spend less time out of the house, you could consider selling stock photos. You can list them on a stock photo marketplace, like Dreamstime or Shutterstock (however this can eat into your profit margen), or you can host them on your own website. Haute Chocolate and IvoryMix are great examples of companies who are hosting their own stock photo sites. If you’re a whiz with drafting and sewing clothes, you could consider selling your own sewing patterns. I’ve found THIS blog post that outlines a few ways to draft digital sewing patterns. You can look at selling your patterns through Etsy or another online marketplace (although this can eat into your profits very quickly), or you can brand yourself as a premium designer with your own dedicated website. Figgy’s has done this beautifully. Are you that person who always gives the perfect gift? Is it always wrapped and presented beautifully? You could consider starting a modern gift basket business. You can start selling on eBay or Etsy (however their fees can eat into your profits), or you can brand yourself and sell through your own website. Some companies who do this well are BumpBox and Packed Party. If you’re a passionately crafty person, you have probably considered selling your handicrafts at some point. If you find the right audience, you can make a tidy profit off handcrafted goods. Make sure you price yourself appropriately to cover both the cost of your materials, and an acceptable hourly wage. You could start selling on eBay or Etsy (however their fees can eat into your profits), or you can brand yourself and sell through your own website. Some companies who do this well are BlueSkyBubble and Lily Avenue. Fiverr is an online marketplace for services, and there’s a market there for just about anything. While Fiverr is a cheap place to find business services, there’s another side to the marketplace. You can find people who are willing to tip a can of baked beans on their head, puppets who will deliver bad news and people who will do a flip over a message of your choice. If you have a skill, commercially relevant or not, you may be able to sell it on Fiverr. If you’re a graphic designer or artist, you could sell your designs through sites like CafePress and Zazzle. Your customers then have the choice of purchasing your designs on items of clothing, homewares, accessories and more. These sites have zero overhead costs. You simply create your designs, and get a percentage of the profits every time a sale is made. To truly make the most of this business model, you will need to invest time into marketing your designs. If you have a computer and an internet connection, and you are able to clearly articulate your thoughts and opinions, you can become a website tester. Website testing involves navigating a client website and performing a set of tasks, then reporting back on the experience. The easiest way to get involved as a website tester is to register with a company like User Testing. Drop shipping is a retail model in which you (as the theoretical drop-shipper) sell products to consumers, without having that product physically in-stock. Instead, when someone purchases from you, you then purchase from your wholesaler. The wholesaler then sends the product directly to your customer. While it sounds great (and easy!) in theory, the reality is that profit margins will be extremely low. You’ll be staking your reputation as a business on the reliability of another business. If you think that drop shipping could be the work from home business idea for you, make sure you thoroughly research your entire supply chain before committing. MLM/Network Marketing refers to companies like MaryKay, Scentsy, Lularoe, Isagenix and Tupperware. While network marketing is not something that I personally recommend or endorse as a business idea, it is a path that MANY people choose to take in the effort to work from home profitably. While traditionally based around hosting in-person parties to demonstrate the products, in recent years there has been a trend for network marketers to host “online parties”, creating a pure work from home business. Typically these companies require an upfront investment, and an ongoing monthly or quarterly sales quota. There is no question that some people can turn a network marketing business into a profitable business. However, I urge you to seek out negative reviews of a company before you join. I firmly believe that this can help you to gain insight into the reality of that business, and make an informed decision about joining. Running a business is never easy (no matter what the company says). If you use your personal social media presence to try and sell products, it WILL impact your friendships. You WILL need to recruit friends and family in order to make real money. If your children are in school or daycare, it can be hard to find a job that offers flexibility for school drop-off and pick-up, or to be available for school concerts and sick days. If this availability is important to you, but you want or need to contribute to your family’s income, I’ve listed 18 ways you can earn a part-time or full-time income while choosing your own working hours. Cleaning houses can be a good way to pick up just a few hours of work each week Given the right circumstances it can provide a steady, predictable income, and the overheads can be extremely low. For each regular client you are able to pick up, you can expect 3-4 hours of work per week. You may even be able to pick up clients by networking at school or daycare. If your clients provide the cleaning supplies and equipment, then travel expenses could be your only weekly cost. When you are working in people’s homes, be sure that your safety is your first priority. Make sure that someone is aware of your location, and that your insurances are up to date. If you’re the sort of person who lives life by a planner, has a wardrobe “system” and colour codes your filing, then you could be a natural professional organiser. A typical professional organiser will come to someones home or place of business, assess their current practices and help them to implement systems to keep their home, office or life organised. This type of business is best served by creating a strong brand and online presence, like a well-designed and organised website. If you are a skilled musician, and good with people, you could consider teaching music. Depending on your skill level, you could teach children or adults, at a beginners or advanced level. Local schools would be a good place to advertise your services. Be aware of local laws, as you may be required to undertake a working with children check before working unattended with minors. If there is a high-school or university subject that you have expertise in, tutoring could be a source of income for you. Advertising in local schools and universities could be a good place to start. If you have children, chances are you know other parents. And if you know parents, chances are you know someone who has been stuck for a babysitter at some point. This could be the perfect business opportunity for you. What parent wouldn’t love knowing that their babysitter is also an experienced parent. If you love being around babies and young children you could take a qualification in baby yoga, baby massage or baby sign language and run weekly classes. You could also run toddler classes with singing, dancing, stories and sensory or messy play. Local daycares, community health centres and schools could be a good place to network and advertise. If you are a qualified teacher, registering as a substitute teacher could be a good way to pick up some occasional work without the commitment of a full-time job. If you’re mad about animals, you could consider using that as the basis for a business. Dog walking and pet sitting have a very low-startup overhead, because you do not need to provide anything other than yourself. Dog grooming could be set up in a very cost effective manner, with just a mobile kit of basic supplies. Local animal parks, pet shops and animal shelters could be good locations to place advertising or start networking for customers. Photography. If you know your way around a decent camera, and can take stunning photos, it can be a flexible business. As a photographer, chances are you will need to sacrifice your weekends to work on location, or in studio. During the week you can focus on editing and other business activities. If you’re looking to book work as a photographer, you will need to have a portfolio, and a well designed website to refer your prospective clients to. I have a FREE guide to building a wordpress website for under $100 available here, to step you through the process. If you have a spare bedroom, a granny flat or an investment property, you could consider becoming an AirBnB Host. If you DON’T have a space to rent through AirBnB, you can still become either a neighbourhood co-host, or an experience host/local tour guide. Legal requirements regarding AirBnB can vary depending on where you live, and in some circumstances it is not legal to let your home on AirBnB. Make sure you do your research before becoming a host on AirBnB. If you have a car and a drivers license, you can consider becoming an Uber driver, or if you’re in the US, a Lyft driver. Both companies allow their drivers to choose their own working hours. Be aware that you will be regarded as an independent contractor, not as an employee, so you will need to file and pay your own taxes and insurances. Love baking? Depending on the regulations regarding home kitchens in your area, you could turn your love of baking into a flexible business. You could sell your products through local cafes and restaurants, or at local markets. You could even sell your products online and offer a local delivery service. If you’re a passionately crafty person, you have probably considered selling your handicrafts at some point. If you find the right audience, you can make a tidy profit off handcrafted goods. Make sure you price yourself appropriately to cover both the cost of your materials, and an acceptable hourly wage. You could look into selling your products though local markets or consignment stores instead of (or as well as) online. If you’re a personal trainer, naturopath, nutritionist or other health professional, you could consider becoming a mobile consultant. You could visit private customers in their homes, or offer group sessions to corporate clients. If you’re a beauty therapist, makeup artist or hairdresser, and you don’t have room in your home to set up a studio (or you simply don’t like the idea of inviting clients into your home), you can perform all these services on a mobile basis. Do you have a home garden that produces an abundance of produce? Or perhaps you have a henhouse full of happy chickens who lay more eggs than your family can eat. You could consider selling your excess to family and friends, or if there is enough, book a stall at your local farmers market to sell your excess. If you’re based in the US or Canada, you can sign up to be a Gigwalker. Gigwalk is a real-time data collection service for brands and companies, and they collect their data by offering “Gigs” to their Gigwalkers. It’s sort of a cross between secret shopping and market research. Gigs pay anywhere between $3 and $100, and doesn’t require that you operate as a business. MLM/Network Marketing refers to companies like MaryKay, Scentsy, Lularoe, Isagenix and Tupperware. While network marketing is not something that I recommend or endorse as a business idea, it is a path that MANY people choose to take in the effort to work from home profitably. While in recent years, there has been a trend to host online parties, the traditional business model has been to host in-peson parties to demonstrate the products. There is no question that some people can turn a network marketing business into a profitable business. However, I urge you to seek out negative reviews of a company before you join. Running a business is never easy (no matter what the company says). If you use your personal social media presence to try and sell products, it WILL impact your friendships. You WILL need to recruit friends and family in order to make real money.